As demand for water rises and rainfall becomes less dependable, fewer Kenyans can rely only on rivers, springs or – for the lucky minority – a piped water supply. Many instead are turning to borehole water. But increasing urbanisation, combined with the effects of climate change and the growing popularity of tapping into underground aquifers, is proving an unsustainable combination, experts say. Kenya’s traditional water sources are rapidly dwindling in volume due to overexploitation, erratic rains and the degradation of catchment areas. In response, the use of underground water is becoming widespread across this water-stressed east African country, whose population of 41 million has access to an annual renewable fresh water supply of only 647 cubic metres per person, according to government figures. But some areas are already experiencing depletion of underground water as well. Kenya’s capital city, Nairobi, has a rapidly growing population of around three million, and several satellite towns emerging on its outskirts. With no piped water, many residents of these new communities have turned to borehole water, resulting in increasing pressure on groundwater resources. Daniel Juma, of Joska Township on Nairobi’s outskirts, has dug a 30-metre (100-foot) borehole to supply his household with water. Already he worries about how long it will last. “It was costly digging the borehole, yet many more are being (dug) in the neighbourhood and it might dry up in a few years,” he says. Boreholes are widely used in Nairobi, given that 40 percent of the city’s population is not directly supplied with piped water. Agatha Thuita, an official of the government’s Water Resources Management Authority (WRMA), said that even those with access to piped water often supplement their supply with borehole water or harvested rainwater because the piped supply is unreliable. The Nairobi Water and Sewerage Company is among those drilling boreholes to improve the water supply to Nairobi residents and supplement the supply of water from dams on the outskirts of the city, Thuita said. Residents without piped water or a borehole buy water from the company’s water tankers. The problem is not confined to Kenya. Groundwater reservoirs are rapidly being depleted around the world. In August 2012, researchers in Canada and the Netherlands found that 80 percent of the world’s aquifers were not being used sustainably, with heavy exploitation of water threatening livelihoods and lives of millions of people. Some 430 km (270 miles) west of Nairobi, in the Mundika area of Busia County, near Kenya’s border with Uganda, people already have seen their boreholes dry up. Jackline Ajiambo is one of many residents who dug a borehole to ensure reliable access to clean water because of lower water levels in rivers and the drying up of springs and streams. “This borehole was initially 28 feet (deep) and drawing water was much easier, but the water level has grown low, compelling us to dig it deeper,” Ajiambo said. Because drilling boreholes with machines is costly, the majority of borehole users rely on hand-dug holes, but they are not always reliable. Milton Onyango’s borehole is 50 feet (15 metres) deep and was once a source of water for both domestic use and the watering of livestock. But it dried up two years ago, and with no source of running water, he now relies on the Sio river, 7 km (4 miles) away. 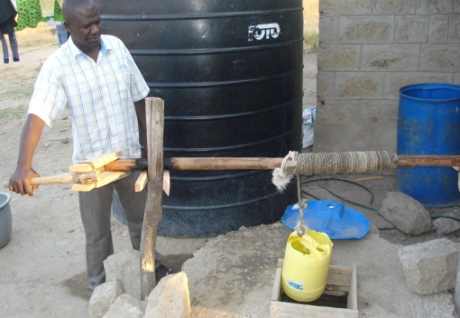 Kenyans rely increasingly on shallow homemade wells. In a culture where fetching water is a woman’s role, Onyango’s wife and two teenage daughters must endure the regular long trek. Officials point to several factors leading to the depletion of traditional water supplies. According to Musembi Munyao, an official with the water ministry in Nairobi, pollution of rivers is partly to blame for the increasing switch to groundwater in Kenya. “If the Nairobi River (had not) been polluted, its water would still be fit for consumption thus reducing the need for drilling boreholes in the city and its environs,” Munyao, a geologist, says. Munyao also criticises the damage done to water catchment areas, such as the destruction of vegetation on mountains and hills. According to the WRMA’s Thuita, rapid urbanisation also increases the amount of land covered in impermeable surfaces such as roads, while deforestation can also lead to more surface-water runoff during the rainy seasons. These factors make it difficult for water to percolate into the ground and recharge aquifers. Although the government has not undertaken detailed monitoring, Thuita believes that two further factors contributing to increasing water stress are low precipitation linked to climate change, and overexploitation of groundwater. “At the coast, heavy extraction of groundwater has led to seawater intrusion causing salinity in borehole water,” she said. Munyao notes that the country’s exact groundwater availability is unknown, making it hard to determine which areas have enough water to tolerate increased exploitation. Addressing the problem, experts say, will require a range of changes, including more harvesting of rainwater to boost supplies and recharge aquifers, and rules to prevent housing estates being developed in water catchment areas where aquifer recharge takes place. Demand for water, however, is driving action. Speaking at the opening of a recent workshop on developing a master plan for Nairobi’s water resources, Kenya’s Prime Minister Raila Odinga said the government intended to meet the needs of the capital and its 13 satellite communities one way or another. “The water available currently meets a mere 60 percent of the demands of the city and its satellite towns,” said Odinga. In response – for better or for worse – the government plans to sink more boreholes. Justus Bahati Wanzala is a writer based in Nairobi. Read more at AlertNet Climate, the Thomson Reuters Foundation’s daily news website on the human impacts of climate change.